If you have any questions or suggestions you are welcome to join our forum discussion about Micro Trend Lines – Scenarios. 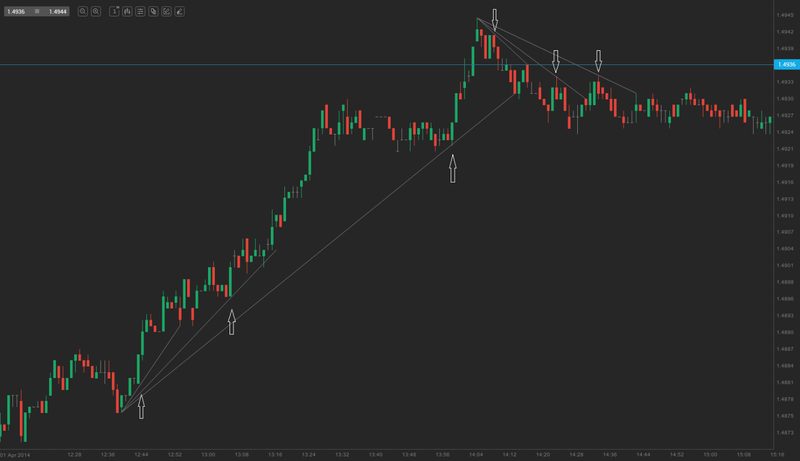 On the chart above we can see a few failed breakouts from micro trend lines, which could have been profitable trades. If we are in a resilient uptrend short positions are not appropriate. This is also valid for micro trend line shorting close or above an Exponential Moving Average (EMA). Going short on bars 1, 2 and 3 on the chart above would have been entering against the underlying uptrend in a close distance from the EMA. Although those micro trend lines sloped downwards (signaling micro downtrends), each one of them actually represented a pullback in the major uptrend. 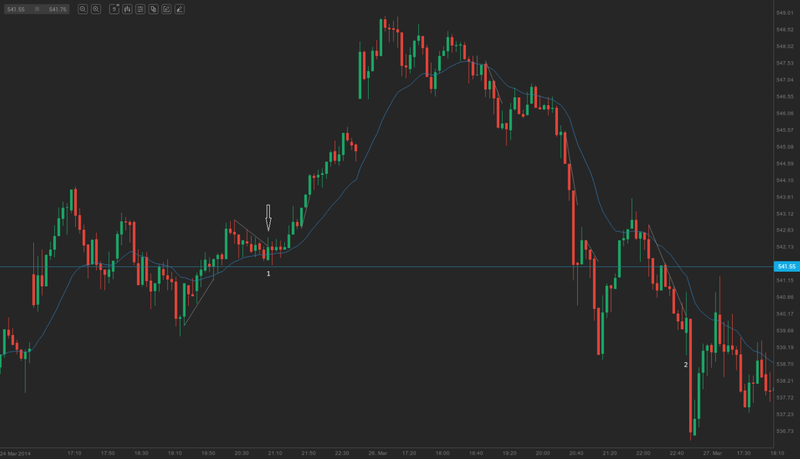 Therefore, a long entry on each pullback would have been a better decision. These micro trend lines were also bull flags and occurred above the EMA (with the exception of one). This boosted the case that the upward movement had strength. 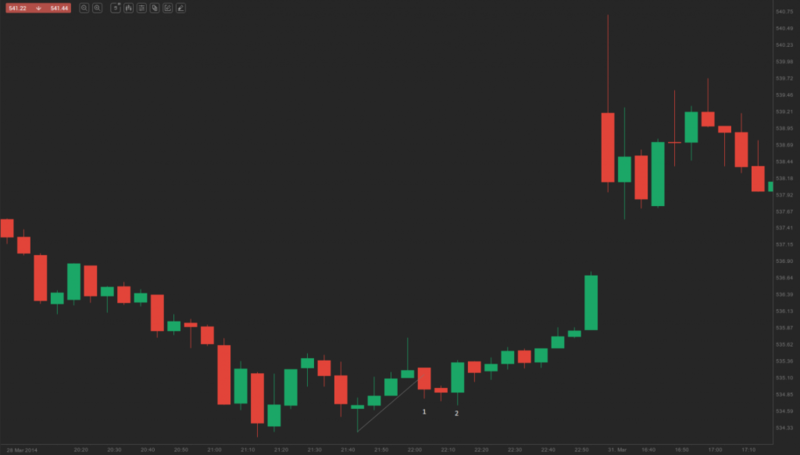 A micro trend line on a 5-minute chart is usually a three- to ten-bar pullback on the 1-minute chart. During the trading session 1-minute chart of EUR/AUD provided entry signals on trend line tests and reversals. It may appear easy examining the chart at the end of the session, but it is far more complicated to make money trading this chart in real time. The best setups may appear bad, but set up quite rapidly for a trader to dispose of them, while the worst setups provide a trader quite much time to enter. Trading on the smallest time frame will cause a trader to take quite many losing trades and not so many profitable ones, that could neutralize losses, so at the end of the day the overall result would probably be a loss of money. On the chart above every consecutive trend line is getting shallower until trend lines in the opposite direction take hold of price action. 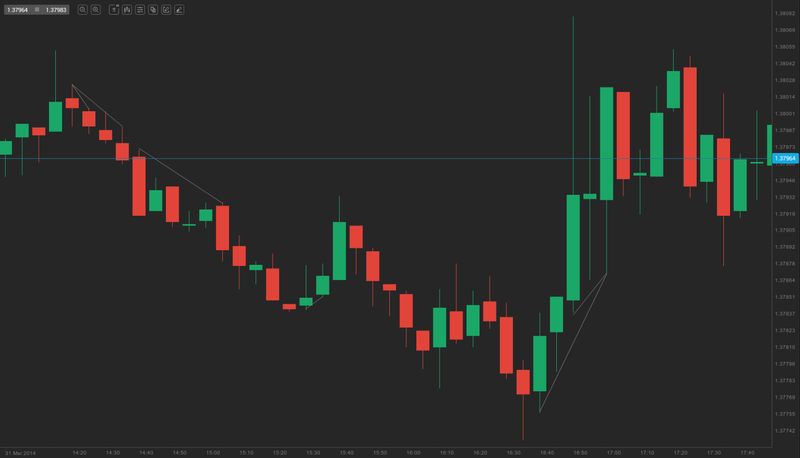 Micro trend lines in strong trends, often even when drawn across adjacent bars, may have failed breakouts, which provides a trader with the opportunity to enter in the direction of the trend. If viewed on a 1-minute chart, they may appear as two-legged pullback setups, but there is no need to do that. It is enough to detect failed breakouts on the 5-minute chart. On the 5-minute chart of AAPL above there were a number of good opportunities to enter in the direction of the trend (failed breakouts from micro trend lines). Usually, if we are in a steep trend, the best decision is to avoid trading small reversals and trade only with the trend. Bar 1 breached a bear micro trend line, but this small downtrend was nothing more than a bull flag, occurring in an uptrend, where prices have been above the EMA for 14 bars. Thus, a trader would have been looking only to go long, not to short (especially above the EMA). Bar 2 was a breakout above a steep tight bear channel, or not an appropriate long entry. On the 5-minute AAPL chart above there is another failed breakout from a micro trend line. Bar 1 plunged below a five-bar micro trend line. In this case a trader would have placed a stop order to buy above its high price and, if not filled, he/she would move the stop on the high price of the following bar. The order would have been filled on bar 2. So, beginners should note, that the majority of breakouts to the downside from bull micro channels in an uptrend usually fail.